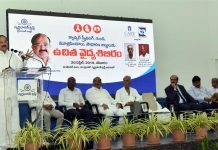 Guntur: SRM University AP hosted Dr. G Satheesh Reddy, eminent scientist and Defence Research Development Organization (DRDO) Chairman, on the campus. He was formally received by SRM University AP Registrar Dr. D. Gunasekaran and Deputy Registrar Dr. B. Sivakumar. Besides SRM AP Faculty, Guntur Joint Collector A. Md. Imtiaz was also present on SRMAP campus for the interaction with Dr. Reddy. Dr. Reddy took a keen interest in faculty research presentations particularly themes relevant to aerospace and defence applications such as advanced materials (high temperature coatings), laser technology (warfare and Tera Hertz applications), additive manufacturing and underwater object detection. Providing pointers on developing new technologies, Dr. Reddy appreciated the PhD credentials and vast experience of SRM AP faculty and invited them to submit proposals in fields relevant to DRDO. Dr. G. Satheesh Reddy spoke of matters like aligning future university led research objectives with national priorities. Dr. Reddy holds four key national government portfolios; He is Secretary to the Government of India in the department of Defence R&D; Chairman, Defence Research Development Organisation (DRDO); Director General, Aeronautical Development Agency (ADA) and Scientific Advisor to the Defence Minister (RM). The faculty of SRMAP expressed their interest in participating with Governmental projects and assist in nation building.